I adore pizza. It’s one of those foods where you can eat it a million different ways. Just make a basic dough and pile on whatever sounds good to you at that moment. 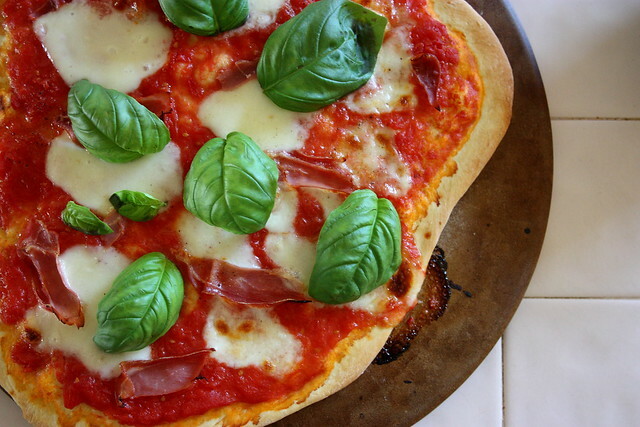 You can make sweet pizzas, savory pizzas, pizzas with lots of ethnic spices, and pizzas that are simple but perfect. I’ve mentioned in the past that I tend to order the same thing whenever I go out because I’m always trying to find the best version of my favorites. My absolute favorite pizza is margherita pizza but I’ve found that 9 out of 10 restaurants absolutely butcher this Italian classic. Most places slice average-tasting tomatoes and arrange it on a bed of shredded mozzarella cheese from a bag then add some ribbons on basil at the end for a sad, wilted finish. I am almost always disappointed by this pizza but when its done right it is the most amazing thing you’ll ever taste. It leaves you wanting more. Dare I compare it to cocaine? So after being let down by one too many margherita pizzas, I decided to just make my own. And you know what? It turned out beautifully. I’m no longer reliant on questionable margherita pizzas from strange restaurants. When I have a craving I can just make my own! 1) Start by making your crust. First activate your yeast in your warm (not boiling!) water. Next, combine the dry ingredients and pour the water/yeast concoction into it. Add the olive oil and stir until the dough mostly forms a ball. It won’t be perfect but most of the large clumps should have formed. Dump the contents of the bowl onto a lightly floured surface and knead the dough for a minute or two until it forms a large ball. Lightly coat the outside with olive oil, place it back in the bowl you mixed it in, and cover it with plastic wrap. Let it sit for a couple hours until it doubles in size. Next, punch it down, knead the ball for another minute, then allow it to rest for 20 more minutes. 2) While your dough is resting the second time, start preheating your oven. Turn it up as hot as it will go–the hotter the better. If possible, preheat your oven to 500. 3) You can start prepping your toppings. One of the best parts about this recipe is the simplicity in it. Pull the whole tomatoes out of the can and put them in a bowl. I found it easiest to just crush them with my hands. Set them aside. 4) Roll out your dough onto a floured pizza stone, coat with a drizzle of olive oil, then pour the crushed tomatoes on top. 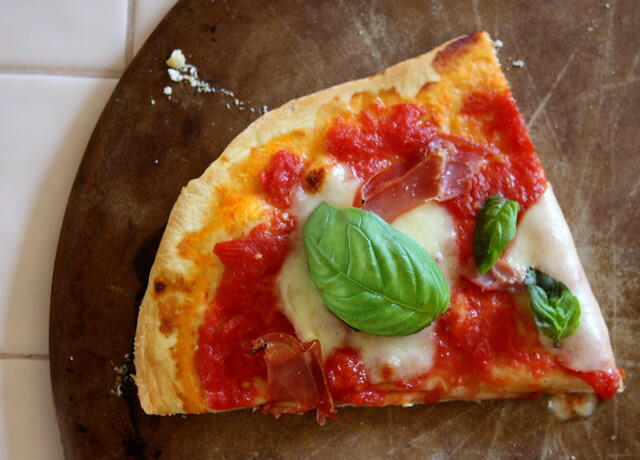 Place your slices of mozzarella around the pizza then tear off pieces of prosciutto to fill in the blank spaces. I like to tear the prosciutto with my hands because it gives the pizza a more rustic look and is much easier to eat in the end. Because San Marzano tomatoes have such incredible flavor, I chose to forgo salt and pepper. If you are unable to find San Marzano tomatoes you might need to add seasoning to taste. 5) Bake your pizza for 10 minutes. The crust will bubble and turn a gorgeous golden color and the cheese will melt into the crushed tomatoes. It’s a really beautiful pizza! Top your finished pizza with as much fresh basil as your heart desires then dig in.